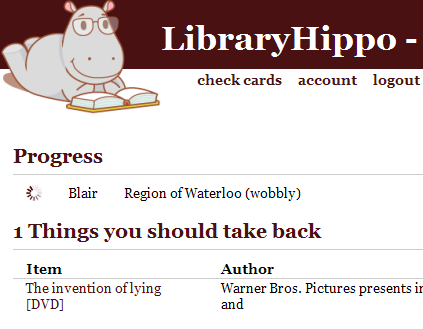 I recently converted the LibraryHippo “Family Status” page to use AJAX to fetch individual card statuses, instead of having the server aggregate all the statuses and send the complete summary back to the user. It was fairly straightforward, with one notable exception – Internet Explorer. When using Firefox or Chrome, as soon as the page loaded, the user would see a list of cards that LibraryHippo was checking, complete with throbbers. As results came in, the matching progress line would disappear and other tables would fill in, holding the results – books that have to go back, holds ready for pickup, etc. I don't mind admitting that I was a little proud of my first foray into AJAXy web programming. That seemed pretty innocuous, and not dissimilar from code that I had elsewhere in the <script> block. Quick web searches revealed nothing, so I resorted to cutting and renaming bits until I could see what was going on. I was down to an HTML body with a single table definition, and the function above. The error persisted. Suspicious, I renamed the count variable to c, and the problem disappeared. It turns out that IE is actually creating a global object that matches the item’s ID! As Rick Strahl explains, the problem is a little worse than that, because the assignment on line 3 above should’ve overwritten the variable reference, but there’s “some whacky scoping going on”. Now everything is working on the new page, and I've every confidence that var will help keep it so.